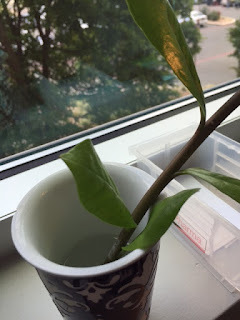 This small sprig fell from a potted plant in the lobby of my building.Our custodian asked if we wanted to attempt to salvage the plant fragment.I cut a sliver of the base and placed it in a cup of water on my window ledge.Two weeks later, I’m beginning to see a re-emergence of root.Once the root is established, I will repot the plant in rich soil infused with nutrients.Exposed to the sun, I expect the plant to grow and later produce seedlings.The original plant will be replicated by first pruning itself.It discarded one branch so that it might gain more. John 15:1-2 15 “I am the true vine, and my Father is the vinedresser. 2 Every branch in me that does not bear fruit he takes away, and every branch that does bear fruit he prunes, that it may bear more fruit.